For those who have a slow internet connection, downloading files from the internet can take upto hours of time. Not everyone of us has the time and patience to stand by our PC and wait for the downloads to finish and then shut down our PC. So if you need to get those downloads finished as soon as possible, you will have to keep your PC turned on and leave for work. While you are at work, even if the downloads are finished earlier, your PC would still be turned on and as long as it runs without any purpose, its going to waste electricity and this will add up to your electricity bill. So how would you turn off your PC remotely from your office? Well, I have tried out several methods to remotely turn off my PC. But the problem is while some methods work on my PC, for some they simply don’t work. However there’s one method that works perfectly fine for remotely shutting down a PC but it will require you to have a android phone. Since android phones are common nowadays, you can make use of the Teamviewer for Remote control app and remotely control your PC from your android phone. The app will mirror your computer’s screen on your Android phone and you would be able to shutdown your computer, like the way you do it on your desktop. Note: Since this is a data intensive method, you have to be connected to a WiFi hotspot or a 3G data connection. Before you can proceed ahead with the instructions, you will have to install the teamviewer client both on your windows PC and on your Android phone. Download and install the respective teamviewer clients from these links. Follow the instructions to remotely shutdown your PC using Teamviewer for Remote Control on Android. Step 1: Download and install the free version of Teamviewer on your PC and note down the ID and password. 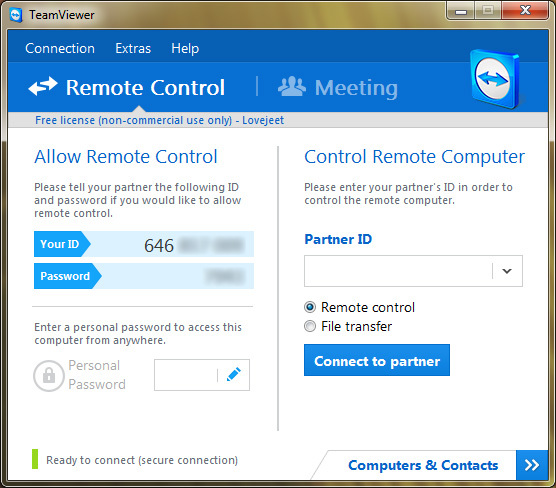 Step 2: Download and install Teamviewer for Remote control on your Android phone. Once installed, open it and enter the ID and password you noted down earlier from the Teamviewer client on your PC. 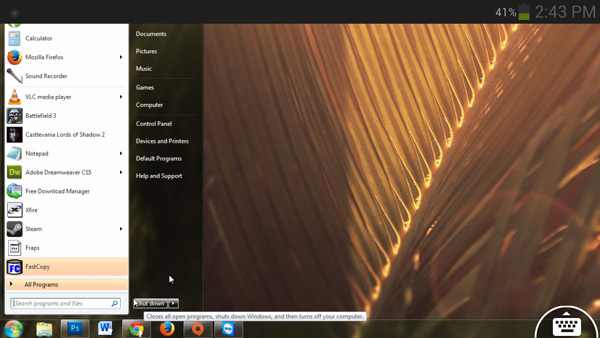 Step 3: Now drag the cursor across your android phone’s screen and tap on the windows start button. Finally click on the shutdown button. There you go, you have successfully shutdown your PC from your android phone. The major advantage of using teamviewer for remote control is, you can anytime check the progress of your downloads and when they are complete you can easily shut down your PC.